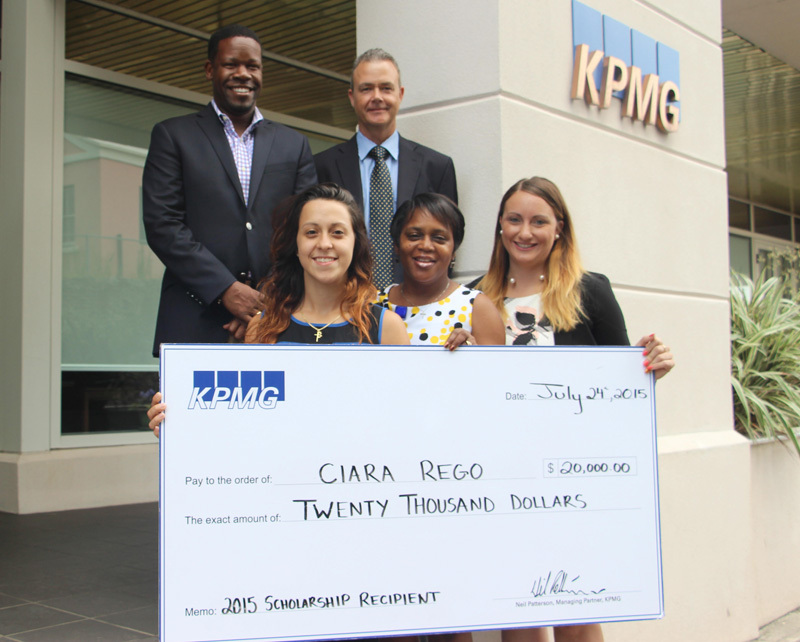 This year’s KPMG scholarship has been awarded to Ciara Rego, a 2014 graduate of Mount Saint Agnes Academy who is pursuing a Bachelor’s Degree in Accounting at St. Leo University in the U.S.A.
Ms Rego’s future goal is to obtain her Certified Public Accounting designation upon completion of University. The scholarship is awarded by the Managing Directors of KPMG in Bermuda and is given to a Bermudian student committed to a career as a Chartered Professional Accountant or Certified Public Accountant. It is valued at $20,000 per annum for each of the next three consecutive years. Back Row, left to right – Craig Bridgewater, Head of Investments & Banking and Steve Woodward, Managing Director of KPMG Enterprise. Front Row, Left to Right: Ciara Rego; Wanda Armstrong, Scholarship Committee Co-Chair & HR Manager and Jennifer Beech, Manager. The KPMG Scholarship provides financial assistance to students towards the completion of an undergraduate degree and is much more than just a number, it is an invitation to a career and a future full of possibilities. Steve Woodward, Managing Director, KPMG in Bermuda said: “We are delighted to be able to award the 2015 KPMG scholarship to Ciara, who has proven herself to be an excellent candidate. Ciara graduated from Mount Saint Agnes Academy with an outstanding academic record which she continued into her freshman year at university. Ms Rego commented, “My mind sat blank while receiving the excellent news from Mrs. Wanda Armstrong [Scholarship Committee Co-Chair and HR Manager]. I was searching for so many words to express my gratitude and excitement, but all I could conclude with was two words: Thank you. I am immensely blessed, honoured, and delighted to be the 2015 KPMG Scholarship Awardee. “The hard work, dedication, and self-motivation that I encountered within myself while getting to this destination has definitely showed its benefit. Nevertheless, this is just the start to another chapter of my life and the beginning of my journey with KPMG. Ms Rego has a passion for personal volunteering, community services and education. Some of her community and volunteer work consists of math tutoring and mentoring, Feeding the Less Fortunate, and serving as a Project Ride assistant. She is a well-rounded individual academically and athletically. Aside from her academic successes, she enjoys playing basketball and volleyball; she is a member of the National Women’s Volleyball Association. This is a well deserved scholarship. Ciara has served me as a teller in the Bank of Butterfield this summer and I was very impressed at how polite, helpful and efficient she was . Congratulations Ciara ! Bank of Butterfield in St George could do with someone like her! CONGRATULATIONS! SHE IS A GREAT!